The Author of this site, Kris Wickstead lives in Carson City, Nevada. Ready for a Sweptline Truck Cruise? Here's a link to a video promoting the 2014 cruise! 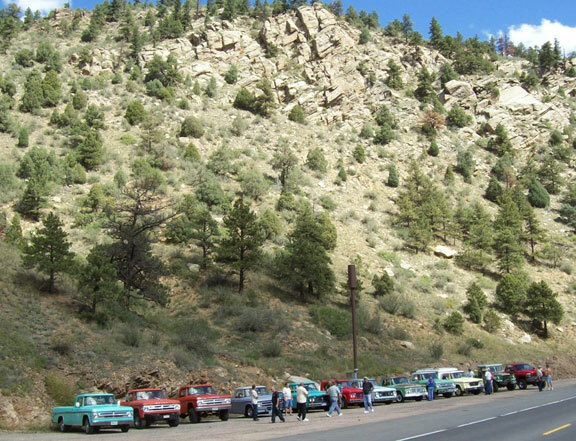 Have you heard of the Annual Sweptline Truck Cruise? 2016's event will be the 10th annual! Want to attend with your truck? If you haven't heard of it, there's still plenty of time to get in on the fun. All Trucks from 1918-1971, including Town Panels, A100's, and Anything and Everything Called DODGE TRUCK is invited! More Info: 720-496-7923 or easystreetllcparts@gmail.com. For more information, click on the image above (or click here) to see the PDF flyer. Hosted/Sponsored by Easy Street, LLC (Truck Parts for Sweptline Dodge Trucks). Event is endorsed by Sweptline.com. How to make a Dodge Truck Bed Utility Trailer. Last Updated 26 Aug 2014 9:30 PM P.S.T. Check out the Sweptline Forums at Sweptline.org, or direct link, Sweptline.org Forums. You'll also want to visit SweptlineParts.com. Special thanks to Scott Blaylock, Proprietor of both aforementioned sites, for his collaborative efforts and hard work. Sweptline.ORG - the new place to share information with other Sweptline Era Enthusiasts. Post photos of your truck or browse through the extensive forums to find what you're looking for. http://www.sweptlineparts.com/ - "Browse the pages of an Original Dodge Truck Parts Catalog on this site. Talk about an excellent, free resource!!! Kudos to HellBelly for hosting this awesome site!!! http://www.uglytruckling.com/ - The UglyTruckling site offers Disc Brake and Master Cylinder with booster upgrades for `61-`71 D-100 and D-200 Pickups. If you need more stopping power, this is the site to visit!!! Looking for parts? See the Part Sources Page or visit the Sweptline.org Forums. Both are quite comprehensive and will help you find exactly what you're looking for.